Assurance of salvation is a God-given awareness that He has accepted the death of Christ on your behalf and forgiven you of your sins. It involves confidence that God loves you, that He has chosen you, and that you will go to heaven. Assurance includes a sense of freedom from the guilt of sin, relief from the fear of judgment, and joy in your relationship with God as your Father. --From Don Whitney, How Can I Be Sure that I’m a Christian? 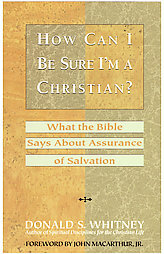 What the Bible Says About Assurance of Salvation (NavPress, 1994): p. 12.